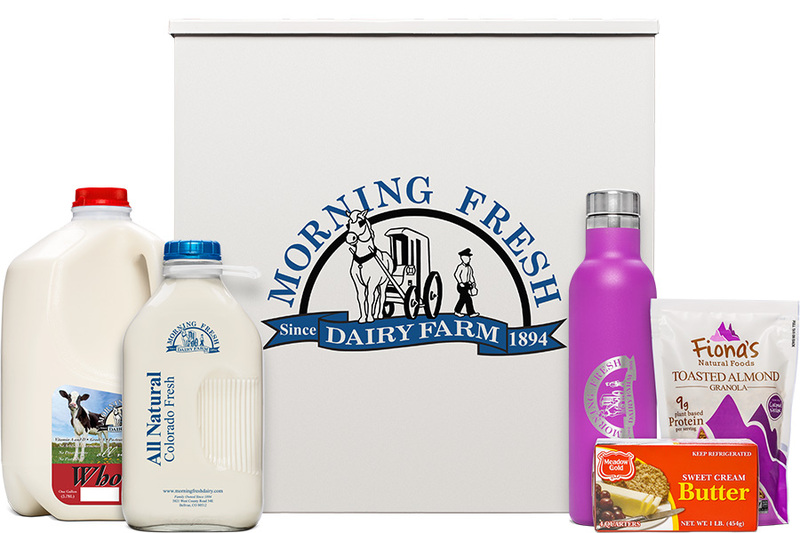 Every week you get all natural dairy and more…delivered to your door. Local, fresh from the farm, delicious…and easy. Since 1894 our family owned All Natural dairy has been operating in the same location. All of our milk comes from our cows right here in Bellvue, Colorado. With sustainable land use practices, top of the line cow care, and minimal processing, Morning Fresh Dairy is the right choice for your family. Come out to the dairy for a tour and see for yourself how your milk gets from mooo to you in just 24 hours. Want to know more about how home delivery works? Read below for tips that’ll knock a cow over! 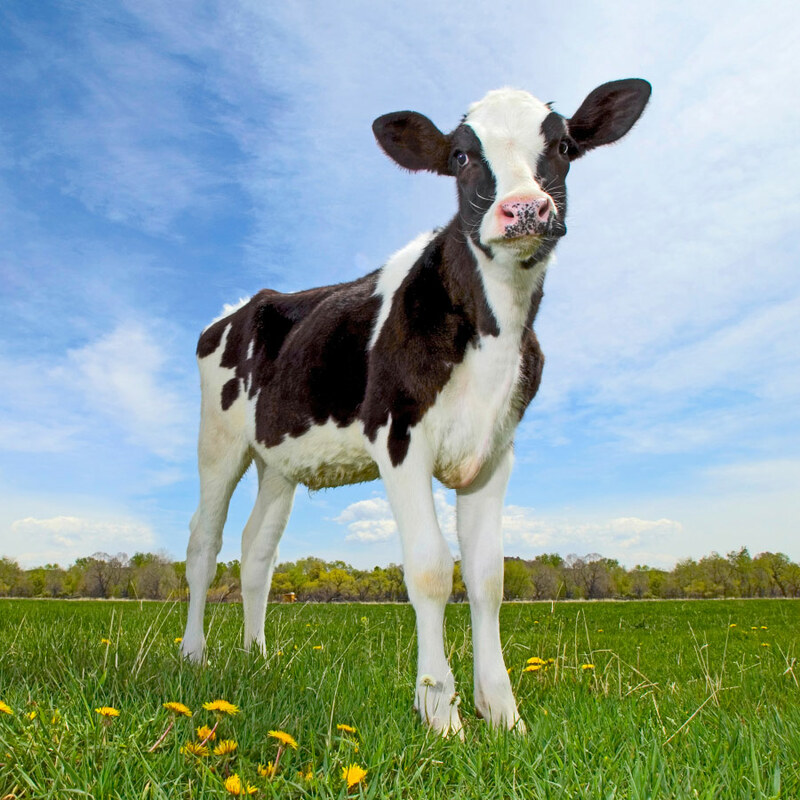 Pssst – no cows were harmed while making this website. There is NO monthly service fee or long-term commitment. For a one-time charge, we provide an insulated cooler to keep your milk at an optimal temperature. All deliveries are made between 1:00 PM and 9:00 PM. Since the drivers deliver in to the evening hours, please make sure to leave your cooler/box in a well-lit area that is easily accessible. Please do not leave anything that is not for the driver in your milk box; your driver will assume it is for him and will bring it back to the dairy! You can skip a delivery online or by calling the office at (970) 482-5789. To skip online, log into your customer account and then click on the "Deliveries" tab. You will see a list of your four upcoming deliveries. Click “Skip Service” at the bottom of each delivery day’s order to skip that specific delivery day. If you want to skip several delivery days, simply click skip under each delivery you would like skipped. If you would like to skip a date that is more than four deliveries away, or put your account on hold for a longer period of time, please call the office. Have you ever ran out of milk before your next delivery? Once you try Morning Fresh milk, you won’t settle for anything else. Not sure where to go for the Morning Fresh Dairy milk you love? Don’t worry! See our map of local retailers to find a store who sells our milk near you. Click on the map to zoom in to find your location and nearby stores; or type in your address, the final destination, and press “Get Route” for detailed directions. All new customers are required to be on autopay. Cards are charged on the 10 th of each month for the previous month’s deliveries. All statements are sent out the first week of the month via email, so you’ll always know what amount you will be charged for on the 10 th. If the 10 th falls on the weekend, your card will be charged the next business day! On extremely cold days, please make sure to bring your milk in as soon as possible. We cannot credit you for frozen, broken milk. Try putting a blanket or towel in your cooler for better insulation. If your milk does freeze, allow it to thaw in your kitchen sink and then place it in the fridge after it thaws. If your bottle does crack or break, please dispose of it. Also, with the snow and ice, please make sure to clear your walkway for your milkman. Safety first, we don't want anyone to slip and fall! On warm days, please make sure to bring your milk in as soon as possible. Try putting a frozen water bottle in your cooler and placing your cooler in a nice, shady spot if you cannot bring in your milk right away. Another option is having your milkman place the milk directly in a plugged-in fridge. This will work if the fridge is in your garage, close to the door, and easily accessible for our milkmen. Call our office if you’d like to try this! If milk temperature exceeds 40 degrees, its shelf life may shorten. You can always change or add to your order as long as you do so before 9:00 AM the day of delivery. You can change your order online, by phone, or by email. If you email us or leave a voicemail, please make sure to leave your name, address, call back number and order change. If you need to change or update your credit card information, please do so through your online account. Once logged in, click the “My Payments” tab to change your credit card information or to set up autopay. Please call or email the office to update your delivery address, phone number or email. You cannot change these things through your online account. Special deliveries are only offered if we are in your neighborhood. Please call the office to see if a special delivery is an option for your location. 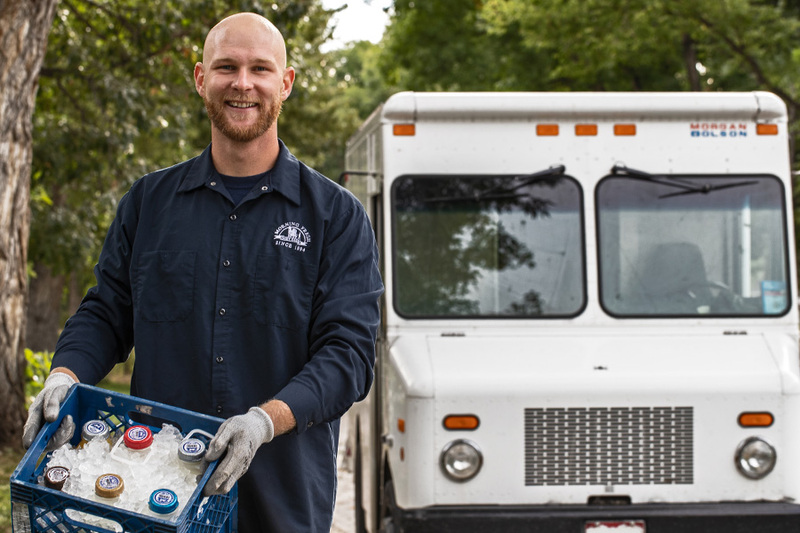 If our milkmen are in your area, we can make a special delivery as long as you order $10 worth of Morning Fresh Dairy products or pay a $5.00 delivery charge. Please rinse out your empty bottles and remove the caps before placing them on the porch or in the cooler for our milkmen to pick up. Caps can be given to your local school for our Caps4Cash fundraiser or thrown away. The caps are already made out of recycled material, so cannot be recycled again. At retail outlets, you may be charged an extra $2.00 for a bottle deposit. The store will give you this back when the glass bottle is returned. If you buy your milk from the store, please return the glass bottle to the store if you want your money back. If you receive milk through home delivery, please return your glass bottles through home delivery. Home delivery does not charge a bottle deposit. People are very curious about where their food comes from and have a lot of questions about our dairy farm. We raise our own cows. We can promise our cows are not injected with hormones to increase their milk production. Where is Morning Fresh Dairy Farm? We are your neighbors! Our dairy has been located in the small town of Bellvue, Colorado for over 100 years. Our farm is nestled in Pleasant Valley, a narrow valley located between Rist Canyon and Poudre Canyon, just northwest of Fort Collins. Our family farm is surrounded by foothills and borders the Poudre River. What makes Morning Fresh Diary BETTER? Your milk is guaranteed fresh, all natural, and free of preservatives from our herd only. We never outsource, so you know exactly where your milk is coming from. Come out for a tour and meet the cows that are producing your milk! See how your milk gets from moo to you in just 24 hours. As opposed to delivering in the middle of the night, we choose to deliver in the afternoon and evenings. We believe this is more convenient for you. We don’t want our milkmen startling anybody, waking you, the kids, or dogs up in the middle of the night. We’re all about freshness and we have found that many of our customers are home during the day, allowing them to bring in their milk faster to the refrigerator. Where does Morning Fresh deliver? Many happy and healthy families receive Morning Fresh milk and other local products we deliver in and around Fort Collins, Loveland, Greeley, Bellvue, Laporte, Wellington, Windsor, Timnath, Ault, Severance, Eaton, and Berthoud. We are unable to deliver to dormitories, apartment buildings, or mobile home parks. How many people get their milk delivered by Morning Fresh? We have about 6,000 happy and healthy customers! How many milkmen does Morning Fresh have? We have 14 milkmen delivering to homes in northern Colorado. Why does Morning Fresh use glass bottles? Like the original milkmen, we believe milk should taste like milk - not plastic, wax, or paper. Glass is a better insulator than other containers which helps the milk stay cold. Glass bottles are also the only reusable containers that are non-porous. They can be thoroughly sanitized, which ensures no residual flavors or odors. Homogenized milk has gone through the homogenization process. Homogenization breaks up the fat cells, or cream, evenly throughout the milk, making the consistency uniform. Nothing is added to the milk during this process. Whole milk that is not homogenized. This means the cream will separate from the milk leaving a thick layer of cream on top. Simply shake your bottle before pouring. Many people prefer our non-homogenized milk because it’s even more “natural” than our homogenized milk. What is ‘ultra-pasteurized’ milk? Does Morning Fresh do this? Ultra-pasteurized milk (UHT) has been flash-heated with steam to 280°F and then vacuum chilled rapidly back down to 38°F. This temperature variation kills more microorganisms than regular pasteurization. Milk that is ultra-pasteurized can be packaged and stored unrefrigerated for long periods of time and have a longer shelf life. We do not do this as it changes the flavor and consistency of milk. We pasteurize our milk which involves flash heating it to 165-168°f then immediately cooling it back to 36°f. Why does Morning Fresh add vitamins A and D to milk? Vitamin A: We are required by law to fortify our fat-free and reduced-fat milk products with vitamin A. This is because the precursor to vitamin A is lost when fat is removed. We fortify all our milks with Vitamin A to ensure adequate nutrition. Please refer to the ingredient label (on our website or gallon containers) for details. Vitamin D: All of our milk is fortified with vitamin D. The National Dairy of Health Office of Dietary Supplements recommends adults intake 600 IUS per day of Vitamin D, and the Vitamin D that naturally occurs in milk is simply not enough. Please refer to the ingredient label (on our website or gallon containers) for details. How long does Morning Fresh milk last in the fridge? Since we use no preservatives, our milk will last 7-10 days in the refrigerator. Habits like leaving the milk out on the counter or failing to put ice in your cooler on the hot days of summer may shorten life span. What does Morning Fresh do to help the environment? At Morning Fresh, are committed to being good neighbors and stewards of our natural resources. Our family has been farming this land for over 100 years and we plan to be here for another 100 years! We know how important and precious water is here in our home state of Colorado. We are proud of our efforts to increase efficiencies and decrease water use at the diary. Waste water from the milk bottling plant and noosa yoghurt facility goes through our onsite waste water treatment plant daily. The solids, such as milk and yoghurt, are separated from the liquids and taken to use as compost at A1 Organics; and the liquids are cleaned, treated, and re-used to water our fields. Waste water from the dairy also goes through the water treatment plant on a daily basis. Manure is separated from the liquids, and is then spread on our fields as a natural, organic fertilizer. Liquids are then cleaned and treated, and used again at the dairy. All water used in the bottling plant and dairy are re-used many times to save resources. We also use sustainable farming techniques like crop rotation and composting to improve soil fertility. Manure from the cows is spread or sprayed on the fields as fertilizer. We use glass bottles to decrease the amount of trash that ends up in our landfills. The majority of our milk stays in Northern Colorado. We do everything we can to decrease our carbon footprint and be responsible stewards of our environment. How does Morning Fresh participate in and support our community? Morning Fresh Dairy Caps4Cash program has given over $150,000 to local schools through the Caps4Cash program. Read all about our Caps4Cash program and how to participate in the “Caps4Cash” section of the website! We also sponsor local events like Treatsylvania at the Farm at Martinez Park, Poudre River Clean Up, and winter coat drives. We participate in local Farmers’ Markets and will begin giving dairy tours starting in spring of 2018. All other days delivered as normal. All deliveries will be delivered as normal.